With a $15 billion shortfall in presently vested and yet unfunded lifetime health benefits and a present $408 million current budget deficit, LAUSD administrators are highly motivated to get rid of as many teachers with high seniority at the top of the salary scale, along with those teachers who are about to vest with lifetime health benefits. Those teachers with both a great deal of seniority and who are about to vest in lifetime health benefits, either by longtime service or the "Rule of 80," where the combination of their age and years of service equals 80, are prime candidates for removal from their jobs with LAUSD by any means- legal or illegal. LAUSD knows that for every teacher at the top of the salary scale it can get rid of, it can hire two novice teachers. LAUSD doesn't seem to care if a disregard for law and collective bargaining rights goes out the window, just as long as it can get rid of these expensive teachers. Administrators know that if they don't get rid of enough teachers and other staff, their own jobs are on the line. In accomplishing this end, LAUSD administrators pay little attention to the truth or the rights of their certificated and classified staff and seem to be totally oblivious to federal and state legislation that makes age discrimination a violation of law. Fabrication of charges against teachers has become more and more commonplace under cover of the incessant attacks against teachers being waged in the mainstream media. If logic played any part in this, it would be clear that teachers have never had the power to determine what direction LAUSD takes, so why would they and not Superintendents Romer, Brewer, Cortines, and now Deasy, along with their entrenched LAUSD bureaucracy be the logical target for responsibility of this longstanding failure at LAUSD and virtually every public school district like it around the United States. LAUSD's charges against hundreds of innocent teachers is clearly attributable only to their age and has increased many fold over the last several years. Logically, a bad economy should have no bearing on the number of "bad" teachers allegedly violating morals charges, but the number of teachers being targeted by LAUSD for removal keeps increasing. By hitting teachers with morals charges under Education Code Section 44939, LAUSD with the collusion of UTLA is able to immediately remove teachers from their jobs without them being able to defend themselves with collective bargaining rights. None of this could be done without the tacit support or failure to act of UTLA and its equally corrupt administration.. If you are an LAUSD employee who is suffering age discrimination, both the federal Equal Employment Opportunity Commission (EEOC) and/or the Department of Fair Employment & Housing (DFEH) want to hear from you. The right to sue allows me to go into state and federal court. If LAUSD loses a discrimination case, it is subject to having all of its federal funding withheld. Everybody needs consequences if change is expected. I know how it feels to be laid off and it is very devastating experience. For those teachers who are the prime candidates for removal from their jobs by any means, I hope you can find the courage to fight for your rights. They should treat you with respect and you deserve what is due for you. 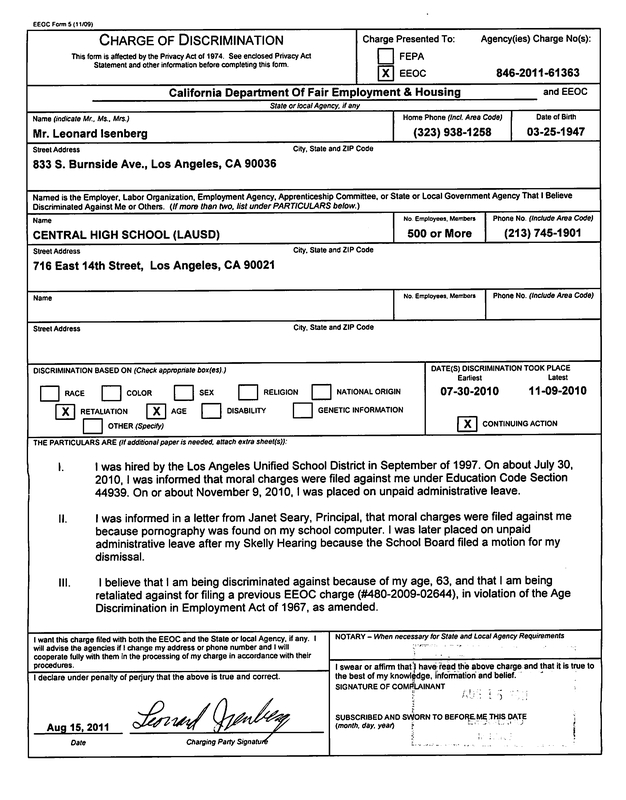 BTW, if anyone needs to fill out a “EEOC Form 5”, I found a blank fillable form here: http://goo.gl/utHdj1. This site PDFfiller also has some tutorials on how to fill it out and a few related legal documents that you might find useful. "Laid off" is nice way to describe being fired on fabricated charges or displaced in complete derogation of seniority or fundamental notions of due process of law guaranteed by both the state and federal constitutions. 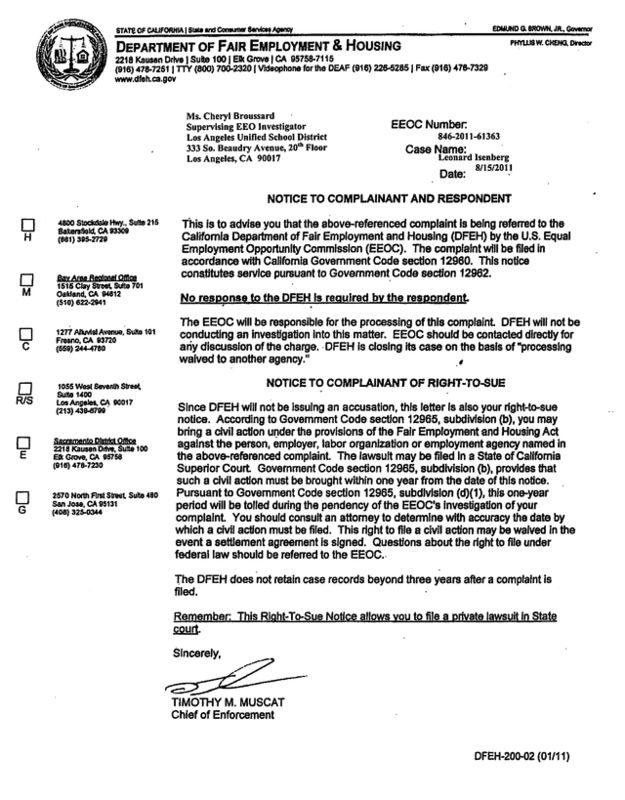 As for EEOC and DFEH, be advised that these hallowed out agencies have no money to investigate any allegations of wrong doing, which by now with the thousands of complaints they have gotten against LAUSD should have already put them on at least inquiry notice that something is rotten at LAUSD. Therefore, you should not waste your time, but rather immediately ask them for a right to sue letter. Be advised that once that is done, the clock starts ticking toward the statute of limitations on any right that you have to sue, so you must be prepared to file a legal cause of action in the appropriate court as soon as you get the right to sue letter. Within the next few days I will publish on this site a questionnaire for targeted teachers who are interested in being part of a consolidated lawsuit financed by my attorneys designed to bring an end to this illegal witch hunt that up until now has allowed LAUSD to get rid of teachers at the top of the salary scale, and/or about to vest in expensive lifetime health, and/or disabled. Bullies are only empowered by inaction. If what we do and what we say can continue to be ignored with impunity, then it is not worth doing. LAUSD cannot ignore a court order or judgment. In supposedly liberal Seattle in the supposedly liberal state of Washington at the supposedly liberal University of Washington the campus police as policy openly discriminate against elderly even former professors. Former(at 70) but still active scientists like myself(a physicist), having moved here for my wife's health issues (she got no decent treatment whatsoever from the much vaunted but greatly disappointing University of Washington medical center)have been forbidden from attending any seminars and colloquia, (or even contacting any faculty by any means whatsoever) in any departments whatsoever under penalty of arrest. (And I was starting to do joint research with several professors in several departments and have many books and much property on UW campus). This is in direct violation of all federal funding agency federal laws. 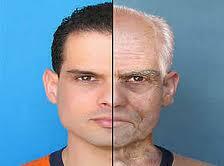 What one sees is the sociological-dysfunctionality of ageism in their FEAR, FEAR of new visitors with new ideas that come from older visitors since much of their public posture(this "STEM" mantra) is media-hype P.R. show-biz to ensnare the young ONLY. And this ageism reinforced by their police is most especially true of departments like psychology, as well as philosophy and earth sciences, with some ageism also in physics and mathematics(the most friendly). Why I have been told by professors half my age that "it is O.K. TO ATTEND SEMINARS/COLLOQUIA, BUT YOU CAN'T ASK ANY QUESTIONS NOR MAKE ANY COMMENTS", even when they are about my work or fields that I was(and still am) an expert in, or in some cases the father of! To attend anything on UW campus, I must actually phone the UW police chief and get his permission, and I simply refuse to be treated in such a fascist ageism manner, reinforced by all department chairs, all deans, the provost(a PSYCHOLOGIST who many of you no doubt know!!! ; just google “Provost University of Washington”), the president, the regents, and seemingly the supposedly liberal governor. University of Washington is a total disappointment with rampant police enforced ageism as official policy!!! Dr. Siegel, I am appalled by this. For this to go on at a college is so disturbing that I beg you to make it widely known. I will publish anything you wish to write on this and circulate it to OPed and other earnest news sources. I am betting Lenny will do the same. We are looking at an educational holocaust. When Fascist came in, they went after intellectuals and educators first. This neo liberal dictatorship has slipped in under a guise of philanthropy, but I suspect the public is becoming hip to it. Unfortunately, the people may not have the power to stop this anymore. Not without some ugly, probably violent drama unfolding first. And the tear gas they unload on students who protest is likely to become a far more lethal weapon with a Gestapo mentality infused in our government and school leadership. Nevertheless, we must do whatever it takes to keep this trend from choking the Ideas of Democracy from our culture. I am sure you never thought it would come to this after a lifetime of scholarship and purpose. I do hope your wife is getting well and that your work is not totally impeded. I hope to hear from you. I feel exactly what you are feeling. I was laid off June 2013 after being a tenured teacher for 14 Years.I had sent a letter into LAUSD to mention if, it was to be that I would be reassigned, because of a disability and medical reasons I would not be able to commute a site that was very far away from my home. I was offered an assignment a few days before school started back. It was over 3 hours drive each way, adding 7 or more hours onto my day. I am 67 years old, at the top of the pay scale. What do you think? Age discrimination. Where do I get one of those forms to complete and file, Thank You so much for the info. I have just been let go as of July 19th 2012. Does anyone know of an Attorney that works on a contingency basis? They have been doing something like this for some time at WalMart. Chomsky makes some very astute observations about the human condirion. If we dont give a damn about the kid who lives up the street, Democracy is doomed. If only these people put as much thought into instruction and efficiency as they do covering their unworthy butts. . . We'd have amazing public schools for half as much. Who are the people at LAUSD that make the decisions affecting your children?